Alternate U.S. 14 runs from U.S. 14-16-20 at Cody east to U.S. 14 at Burgess Junction via Powell, Lovell, Big Horn National Recreation Area, and Medicine Wheel. U.S. 14A follows State Control Route 32 from Cody to Garland via Powell, State Control Route 39 from Garland to U.S. 310 via Byron, State Control Route 34 from U.S. 310 North to U.S. 310 South via Lovell, and State Control Route 35 from U.S. 310 South to Burgess Junction. 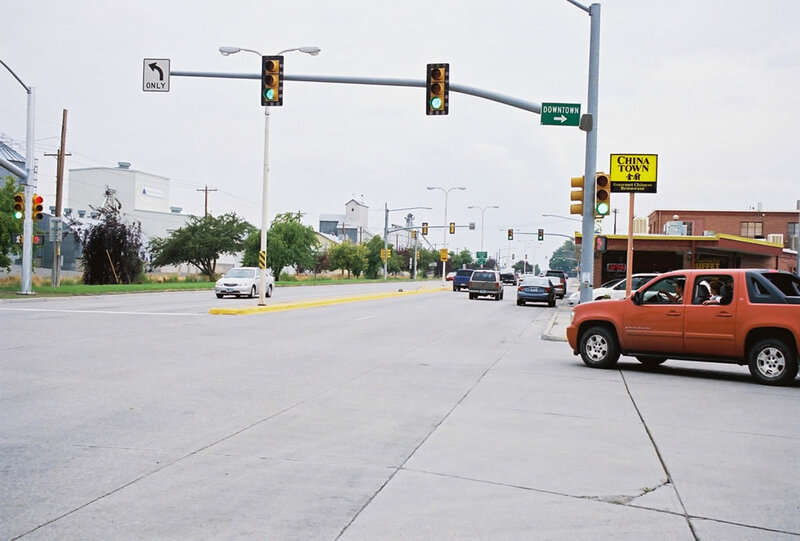 Alternate U.S. 14 is the only signed alternate route in Wyoming, commissioned around 1965. In 1936, the year U.S. 14 was first commissioned in Wyoming, the route now taken by U.S. 14A was part of the mainline U.S. 14 while the current mainline U.S. 14 was called U.S. 20 and Wyo. 520. 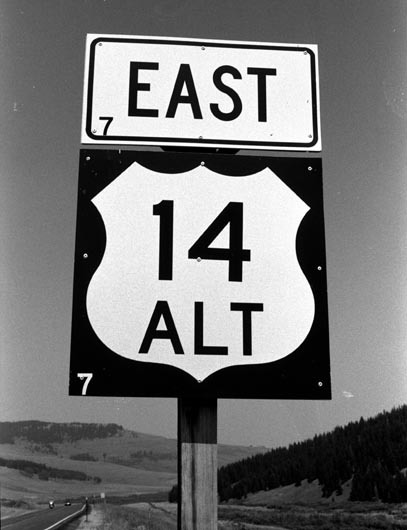 After the routing for U.S. 14 was shifted to its present alignment in 1945, the old routing was renamed Wyoming 14. By the mid-1960s, Wyo. 14 was recommissioned as U.S. 14A. 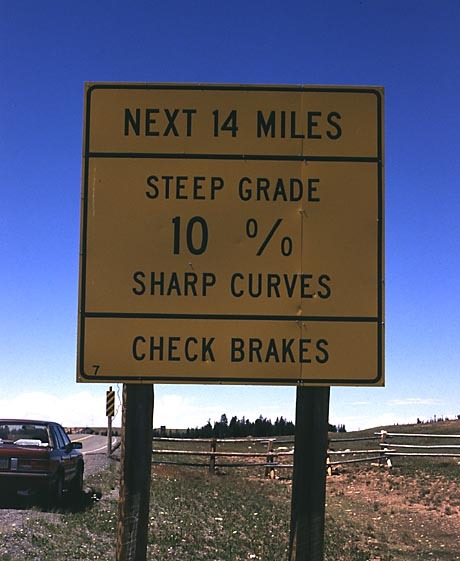 Signs describing the history, progress, and construction of U.S. 14A between Burgess Junction and Lovell was approved by the Wyoming Transportation Commission in September 1996. 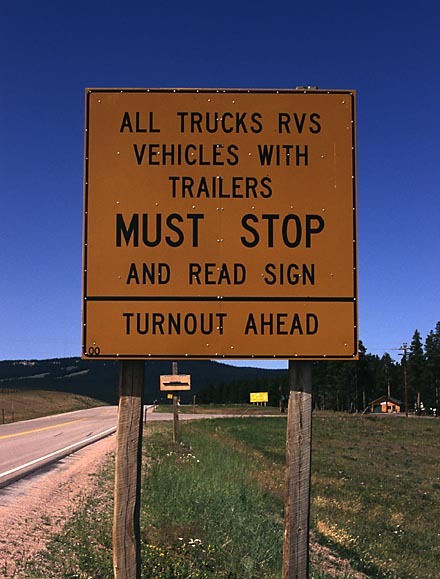 These signs are erected at turnouts on the road where motorists can take time to read the lengthy history of the road. 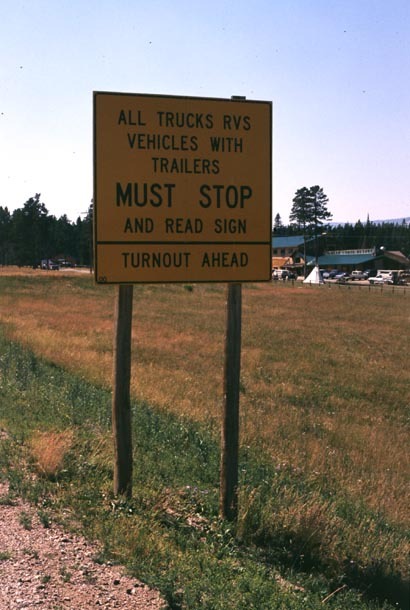 Former State Senator Cal Taggart, who has been a long-time advocate of the northern route, was the principal force behind the plan to have signs made to recognize the many people involved and effort that went into the location. What is now U.S. 14A was originally a wagon track notched into the side of the mountain in about 1880. It was used until the 1920s, when Lovell businessmen began a volunteer labor effort to build an automobile road up from the crossing of Five Springs Creek. This route connected to the original U.S. 420 and U.S. 310 in late 1926, but work continued by hand well into the 1930s. After becoming part of mainline U.S. 14 in the late 1930s and Wyoming 14 during the 1940s and 1950s, U.S. 14A underwent a 20-year, $24 million construction effort that lasted from 1963 until June 24, 1983. U.S. 14A was commissioned at roughly the same time that this massive construction project began. Alternate U.S. 14 is signed with a regular square US highway marker with a small "14" at the top, and "ALT" underneath within the shield. 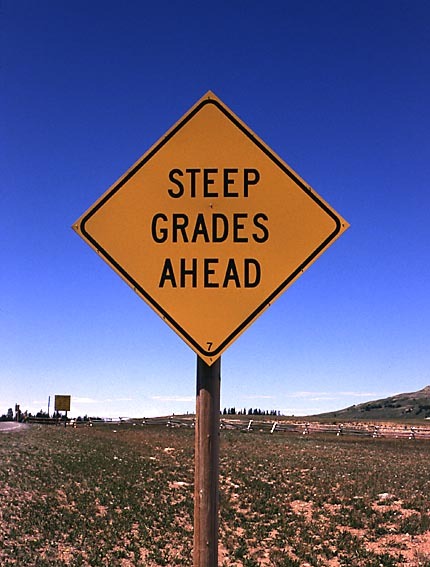 This is similar to the signs that Illinois erected for Business U.S. 51 thru Bloomington-Normal, but with the number on top. These US-14 ALT signs are relatively new. 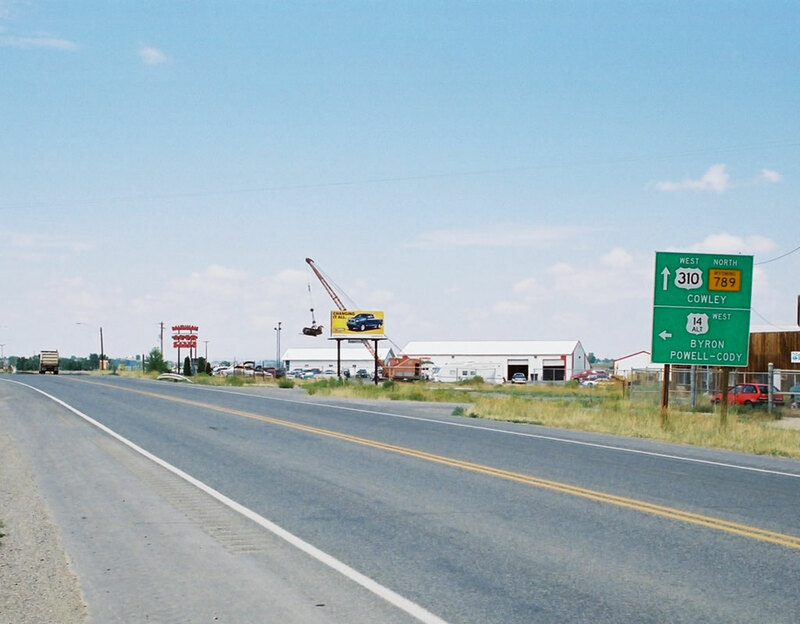 Alternate U.S. 14 and Wyoming 120 shields northeast of Cody. Photo taken by Rich Carlson, 1999. This route marker faces eastbound traffic on U.S. 14 ALT going toward Burgess Junction. The shield shape is typical of Wyoming, with more exaggerated curves than the federal-standard shield. Note the word "ALT" is written within the shield. Photo taken by Jonathan Winkler, 8/00. Alternate U.S. 14, which begins at U.S. 14 at Burgess Junction, travels west through Lovell and Powell, then reconnects with U.S. 14 in Cody. 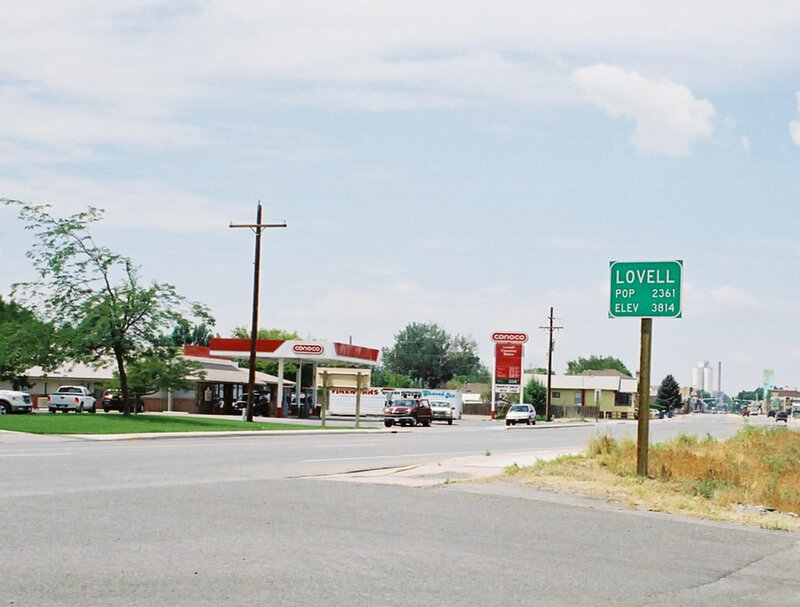 Here, westbound Alternate U.S. 14 enters Lovell (population 2,361 and elevation 3,814 feet above sea level). Photo taken by Alfred Regnery (07/27/07). After the U.S. 310/Wyoming 789 intersection, westbound Alternate U.S. 14 enters Powell. Near downtown, Alternate U.S. 14 approaches the junction with Wyoming 295 north to Elk Basin. Photo taken by Alfred Regnery (07/26/07). 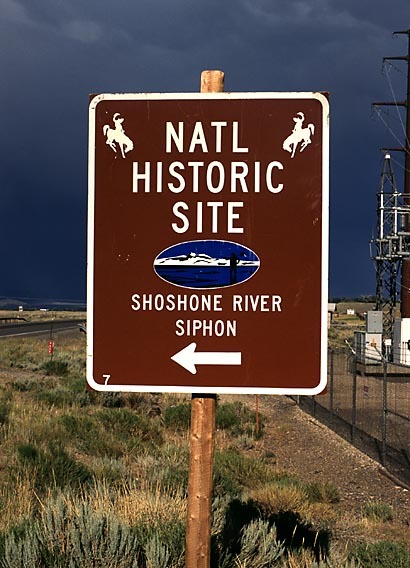 Alternate U.S. 14 Shoshone River Historical Site signage. Photo taken by Jonathan Winkler, 8/00. 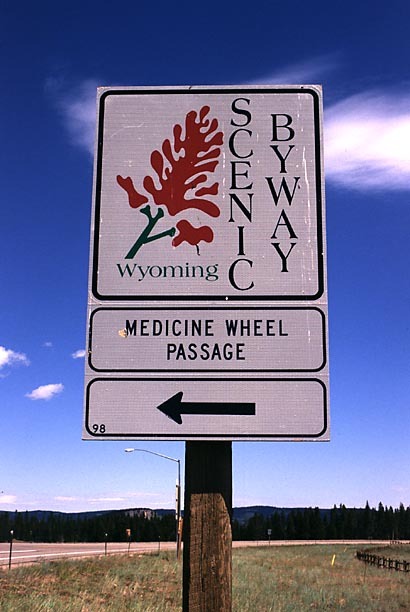 Alternate U.S. 14 is the Medicine Wheel Scenic Byway, so named by the Medicine Wheel, a site of spiritual meaning to Native Americans. Its origins are shrouded in mystery. Photo taken by Jonathan Winkler, 8/00. 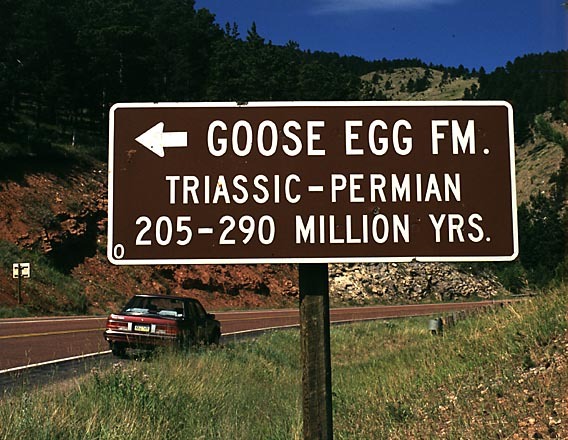 Alternate U.S. 14 signage for the Goose Egg Stratum Marker. Photo taken by Jonathan Winkler, 8/00. 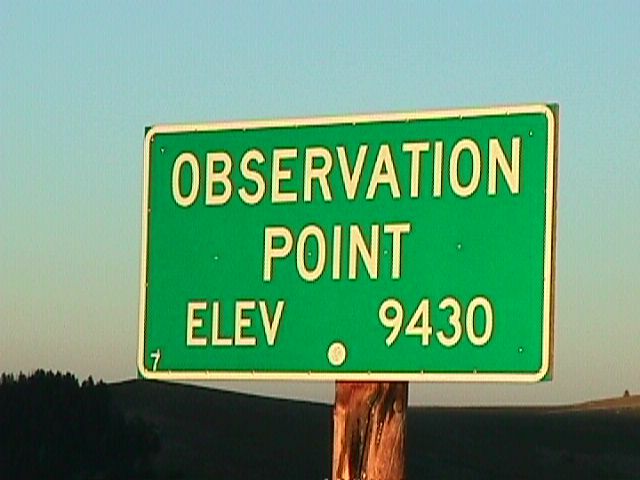 Alternate U.S. 14 observation point at Elevation 9,430 feet in the Bighorn Mountains. Photo taken by Jim Teresco, 7/25/99. 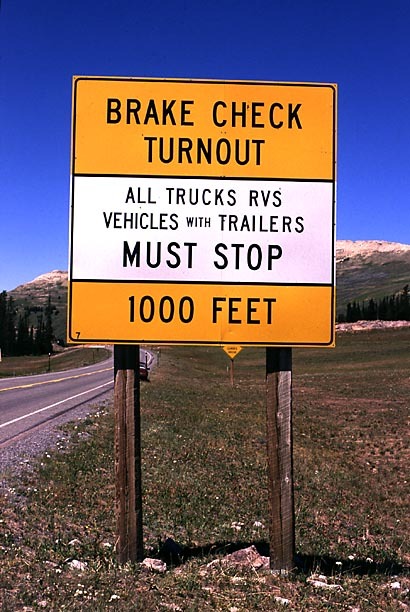 This sign (rectangular, in warning-sign colors) faces westbound traffic at Burgess Junction and advises truck and R.V. 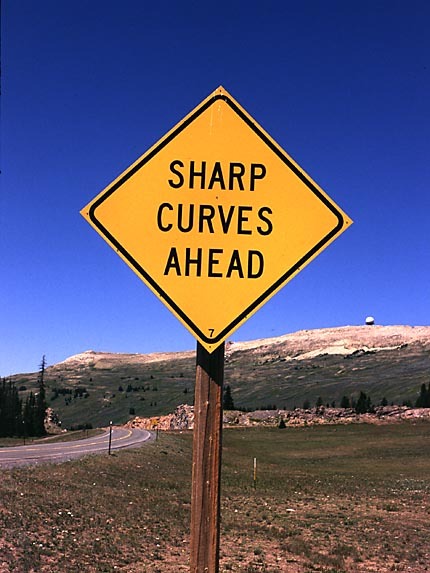 drivers that they must turn out and read a sign which contains a map of U.S. 14 and U.S. 14A between that crossroads and Cody, setting forth all the curves, downslopes, and engine and brake cooling points in color-coded symbology. The next picture shows the map. 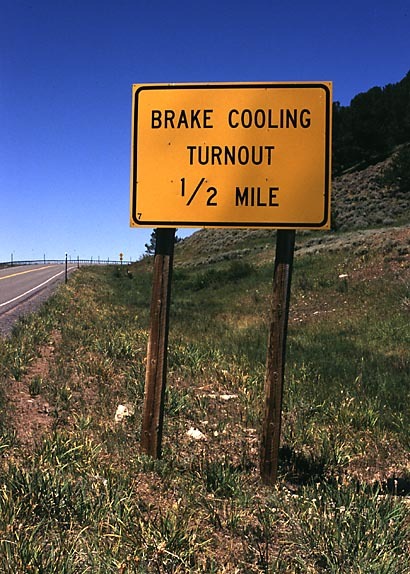 (It is difficult to determine the alphabet series used on this sign owing to the distorted perspective, but it is probably Series D.) Photo taken by Jonathan Winkler, 8/00. 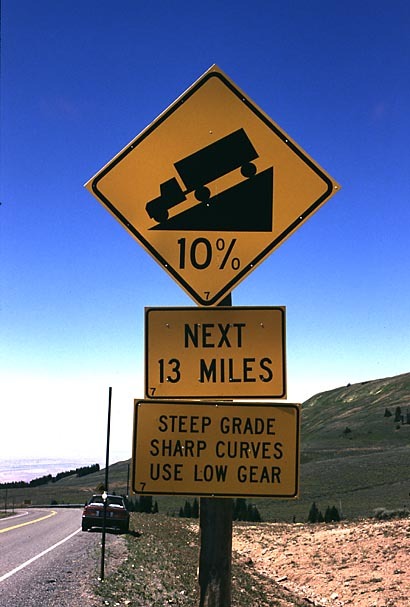 Alternate U.S. 14 downgrade signage. 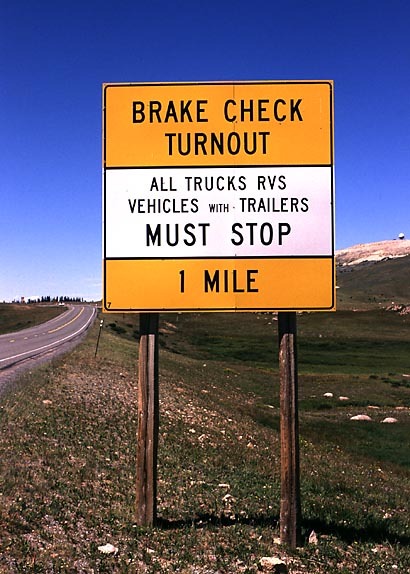 These signs show the signs present on the route leaving the Bighorn Mountains toward Lovell. Photos taken by Jonathan Winkler, 8/00. Page Updated August 27, 2011.